Yesterday, May corn closed 3 3/4 lower settling at $3.82 1/2, and December was 3 1/2 lower at $4.07 1/4. Bearish to the market was funds selling some 7,000 contracts. On the bullish side, only 3% of U.S. corn has been planted, lagging behind 6% from last year and the 5 yr. average of 5%. U.S. corn shipment had another good week, but trade is waiting for fresh news to drive this market. 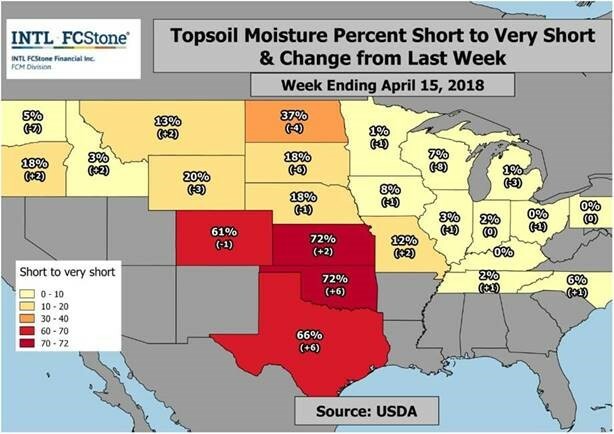 Holding back a weather rally is that in May of 2011 Iowa farmers were able to plant 61% of the corn crop in a week, and in 2013 planted 43% of the corn crop in a 1 week. The May bean contract closed 12 1/4 lower yesterday, settling at $10.42 and the November was 9 1/4 lower at $10.40 1/4. Funds were net sellers of 7,500 contracts of beans. U.S. beans traded lower as the export inspections came in lower, Chinese are buying beans in Brazil, and corn planting delay could potentially push corn acres to beans. The NOPA crush report came out with strong crush numbers yesterday, the U.S. crushed 171.858 million bushels, above the estimate of 168.2 million bushels. All May calls expire this Friday, April 20th. If you are holding on to them, today would be a good time to sell to get some premium back. Also, Extended Price contracts expire this week; you can either roll the contract forward or price it out. Please contact your local GMA or call (877) 778-2226 for assistance with any of these. Charts compliments of INTL FCStone.